More than a vendor - we're your broadcast partners. In today's fast-moving media climate, sometimes it can feel like your content is lost in the shuffle. At Carr-Hughes Productions, we don't just cover your event -- we document it as part of your history. From live remote production that captures the essence of your event, to impactful postproduction that conveys and reinforces your message, we draw from a lifetime of experience earned covering the biggest events in the world for the most prominent platforms in the game. Whether your project calls for live television broadcasting, webcasting, branded content, feature/documentary content, videography, or all of the above, Carr-Hughes can provide a production package custom to your needs. We at Carr-Hughes Productions are the proven experts in getting your sport or event on TV. We are unsurpassed in taking non-traditional sports and developing unique, creative and significant national TV programming for them. Unless you're one of the big players like the NFL, NASCAR and the NBA commanding big rights fees, you may be struggling to find a way to reach a national TV audience. Working with you and your sponsors, and utilizing the demographic strengths that your sport or event posses, we will identify potential network partners for you as well as the likely programming scenario needed to get you on TV, be it a "Time Buy", a "Barter" deal, network show, or one of the myriad of hybrid deals that are so common in TV today. In the age of smartphones and social media, capturing your event properly, and in real-time, is more important than ever. We help you capture that excitement, whether your chosen platform is network television, a streaming webcast, or both. Our partnerships with the most high-powered vendors in the industry give us the ability to meet the specific needs of your project and broadcast it to audiences around the world. Whether you need something done on a quick turnaround, require award-winning creative services -- or both -- we are your one-stop shop for edited content on a deadline. With Avid Symphony, Adobe Creative Suite, and Cinema 4D in tow, along with our ace-level feature photography, documentary/reality field production capabilities, copywriting and in-house voiceover talent, our experienced staff is a turnkey operation designed to get high-end content out to your audience while it's still fresh. Not all footage in a production is fed directly into the production unit. Recording content on foot allows for some of the best moments to be caught and implemented into any broadcast. Carr-Hughes Productions utilizes their experienced ENG/EFP staff and equipment within nearly every production to create several features that help enhance the quality of the broadcast. Carr-Hughes Productions can be your connection to the world through our full broadcast quality direct HD fiber connection to the New York fiber ring on our own dedicated line. This connectivity allows CHP to send and receive simultaneously compressed live HD video and audio to and from essentially anywhere in the world. In addition, when combined with our high-speed Signiant MediaShuttle server, Carr-Hughes can deliver your content expeditiously anytime, anywhere. 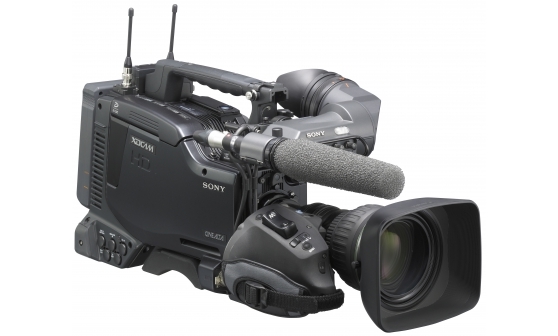 "Its newly developed MPEG HD422 codec, the XDCAM HD422 Series provides high-quality video and audio recording capabilities, with an image resolution of 1920 x 1080 and eight-channel 24-bit uncompressed audio." "4K Exmor Super 35mm CMOS Sensor. Capture 1920 x 1080/60p AVCHD Video. 4K/2K 12-Bit RAW to AXS-R5 Recorder. Up to 960 fps Super Slow Motion. CineGamma Curves Including S-Log2. ISO 320 to 64,000. Dual XLR, HDMI & 3G/HD-SDI Connectivity. SD/SDHC/SDXC and Memory Stick Duo Slots. FMU Port Supports Optional Memory"
"PMW-300K1 XDCAM camcorder is the first semi-shoulder mount camcorder to combine the benefits of 1/2-inch type Exmor™ Full HD 3CMOS sensor technology with 50Mbps HD recording at MPEG HD422, meeting broadcast standards around the world. The high bit rate ensures excellent capture of fast moving objects, while its chroma subsampling feature is perfect for a wide range of video recording situations." "Offers a 25x HD zoom lens, three 1/3"-type Exmor CMOS sensors for high resolution, low noise and wide dynamic range, and a variable Neutral Density filter which provides more flexibility in density control and a broader range of shooting techniques. By using the wireless function, the camera connection is broadened to other destinations for sharing content by transfering files. In addition, a live streaming feature is available via cellular connection, Wi-Fi, and ethernet." "ZSG-200M Zoom Controller and FPD400 Servo Focus Control"
"The TR1616 is a 16 in/16 out analog to BLU link and BLU link to analog audio converter. By providing a modular yet simple solution, the TR1616 is highly expandable and extremely easy to configure. With 16 precision dbx mic preamps and combo style input jacks, the TR1616 accepts line level or mic level input signals." "ABonAir’s AB425 wireless broadcast system enables camera teams to transmit broadcast sessions directly from cameras to control centers over the air. The system supports all the resolutions: 1080p, 1080i, 720p, NTSC, PAL at all frame rates 60fps, 59.94, 50, 30, 29.97, 25 and 24." "Sleek, pocket-sized design (2.1" W x 2.2" H x 4.8" D). Allows POV-style image capture from a long distance. Features 1/4" 20 socket for easy mounting. Optical Image Stabilizer (OIS) function ensures shots remain clear while walking or zooming. Dynamic Range Stretch (DRS) feature suppresses blocked shadows and blown highlights. Slow shutter and synchro scan functions. Color control and skin tone detail functions. Cine-like Gamma Curves (seven different gamma modes). HD focus assist functions and slow shutter and synchro scan. It has endless point-of-view applications for use in nature observation, video production, newsgathering, law enforcement, surveillance, sports, healthcare, education and much more. 43mm lens filter size (lens options available). Weigh: approximately .61 pound. Cables are detachable (from recorder and from camera head) for total flexibility." "The camera features a 1/3" CMOS sensor and accepts optional C-mount or CS-mount lenses supporting auto-iris. The camera captures HD video at 1080p 29.97/59.94, 1080i 59.94, and 720p 59.94 fps allowing you to easily integrate the camera into an infrastructure that supports broadcast frame rates. 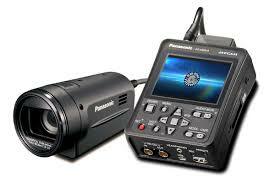 The camera incorporates one HD/3G-SDI output as well as a CVBs (composite) video output." "Carbon fiber tripod systems, perfectly designed for the latest generation of professional digital camcorders in today market. Featuring 12-step counterbalance system, for the perfect counterbalance of the camera even with a light or a heavy lens, and offers 7-steps of vertical and horizontal drag, for smooth camerawork under the toughest of rough conditions." "The FVW-500HS is a video writer (telestrator) system that enables freehand drawing and positioning of objects and image files over video. The FVW-500HS is ideal not only for replay commentary in sports broadcasts, weather forecasts, and news programs, but also provides the ultimate in freehand tools for creating educational materials and usage in various medical venues." "With the most comprehensive set of integrated production capabilities available in any Skype TX single-caller video calling system, TalkShow VS 100 gives you total control of your video interviews before, during, and after the show." 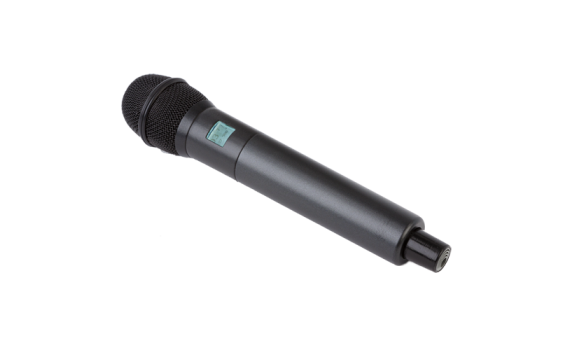 "The Digital Hybrid Wireless handheld represents an elegant solution for a variety of wireless microphone applications including live performance, broadcast, AV rental and houses of worship. Incorporates many advanced features to provide high quality speech and vocal reinforcement." "Wireless IFB (interruptible fold back) systems are used for talent cueing and crew communications in broadcast and motion picture production. In other cases, the IFB system is used by directors and other management to monitor program audio during a production. The IFB R1a receiver provides simplicity and flexibility in a package that is intuitive for untrained users to operate." "An economical solution designed for transmission of SD, HD and 3G–SDI signals on single mode fiber. Perfect for today’s professional and broadcast applications." -Comments from the Keeneland Association on the "Autumn at Keeneland" Series. Jim has over 30 years of experience in Television production, is a five time Emmy award winner and brings valuable experience to every production he is involved with. Credits include 13 Olympic Games with NBC & CBS, numerous World Championships and National Championships for Track & Field, Skiing, Equestrian and more around the country and the world as a Coordinating Producer, Producer and Director. Phil joined Carr-Hughes in 2015, after working alongside them as their commercial banker for 14 years. He brings that familiarity combined with over 17 years of experience working with high profile relationships to the company. His passion for working with clients and learning about their needs is evident as he works with them, sponsors and networks to develop productions that meet their needs and expand awareness of their events. Bob's extensive international experience includes years of host broadcasts including overseeing the coverage from the last two Winter Olympics (Torino & Vancouver) and major productions in 10 countries on three continents. Bob maintains extensive contacts with many domestic and international networks giving Carr-Hughes reach into the programming operations of networks worldwide. Jeff began his career as a freelance writer, feature producer, editor and creative consultant, spending 15 years traveling the globe to work on countless sports and entertainment productions. The recipient of six Sports Emmy Awards for his work with NBC Olympics, ESPN and HBO Sports, he has supervised post and feature production for Carr-Hughes since joining the staff in 2013, working hard to create compelling content with a high-end look and feel to projects of all sizes. Jeff is a proud husband and father, an accomplished guitarist, extremely messy cook, and the alpha male to two hound dogs. Melissa joined the Carr-Hughes team in 2004 and has nineteen years experience working in the sports and entertainment industry. Based in our Saratoga Springs office, she serves as our Controller, Crewer and oversees all Human Resource matters. With a passion for volunteering and helping others, she is constantly organizing company-wide activities to help support our local community. Melissa lives in Glens Falls, New York with her husband Bob and their son’s, Cooper & Brady. While she may wear many hats during working hours, her favorite job title is that of Mom. She spends most of her free time on the road, in the minivan she swore she would never own (and love), driving her very active boys to their many games and practices. Production and operations management is the specialty for Don Krone, whose experience ranges across Olympic and World Championship events in a number of winter sports. Prior to joining Carr-Hughes in 2012, Don produced the global television programs of the FIBT (International Bobsleigh & Skeleton Federation) for 13 years and has been a TV and special event technical manager at events such as the ESPN Great Outdoor Games, the Gravity Games, and the X Games. Andrew joined Carr-Hughes in April of 2014 as a Production Manager, after working for a year in the Department of Student Activities at the University of Connecticut. He has worked extensively on Track and Field and Horse Racing broadcasts, ensuring the logistics of their operational aspects. Always the consummate story-teller, Andrew comes from an extensive background in radio news broadcasting during his undergraduate tenure at UConn, sitting for multiple interviews with the Governor of Connecticut and members of the Connecticut Congressional delegation under his belt. An avid traveler, he also hopes to visit each National Park in the United States. Bob joined Carr-Hughes in November of 2005. Bob edits and shoots show content ranging from network sports, corporate, news, commercial and documentary. His work assignments have taken him to 48 states and abroad to locations in Europe, Australia and Dubai. Whether behind the camera or in the edit suite he is passionate about the content. In his free time, there's no place he'd rather be than with his wife Melissa and their two sons on a road trip or spending time camping on the Schroon River. Janet joined Carr-Hughes in 2011 after spending over 18 years working in Public Relations. She oversees day to day operations in our main office and handles travel coordination for all Carr-Hughes shows. Janet and her husband, Geoff, live in the beautiful Adirondack Region, next to Gore Mountain. She spends as much time as possible outside of work enjoying her beautiful granddaughters Lily and Gabby. Andrew joined Carr-Hughes in May of 2017, after graduating with a Bachelor’s degree in Political Science from Siena College. The production team’s “jack of all trades”, Andrew has a variety of supporting roles ranging from assistant editor, to tape library manager, and graphic designer. Outside of work, Andrew is an amateur genealogist and avid fantasy football manager. Peter joined Carr-Hughes in July of 2017 as an editor with over 20 years of post-production experience working in NYC, Los Angeles and the Saratoga area. A graduate of Syracuse University, he began his career at a post house in NYC and moved on to become the lead video editor for one of the most renowned video game companies in the world. Peter has created award-winning media with honorable mentions from The New York Times, PC Gamer and Kotaku, to name a few. Peter, along with his beautiful wife Lisa and daughter Allison, love to spend their free time together outdoors enjoying the incredible Adirondacks. Andrew joined Carr-Hughes in October of 2018 as a Production Assistant. After graduating from Syracuse University in 2016, Andrew found himself exploring every facet of the sports media field. His experience in public address announcing, baseball play-by-play and sports writing brought him all over New York State and to Washington D.C. Outside of work, Andrew is a die-hard Yankee fan and a musician.